The cumulus cells that surround the egg are removed using an enzyme called hyaluronidase, this historically comes from bovine testis but new technology has provided a pure recombinant product that is now available. A small amount of washed sperm is placed into thick viscous media containing poly vinyl pyrrolidone (PVP) in a dish. The PVP slows the sperm down so that they can be morphologically assessed. The most normal looking sperm are selected and then immobilized by squashing their tales with a glass injection needle. The sperm are sucked into the needle tail first ready to be injected. The egg is then placed under a microscope and moved using micromanipulation devices (micromanipulators, microinjectors and micropipettes). 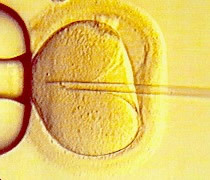 A holding pipette stablizes the mature oocyte then from the opposite site a thin, hollow glass needle is pierced into the inner part of the oocyte. it is loaded with a single sperm that will be expelled into the oocyte. The pictured oocyte has an extruded polar body at about 12 o'clock indicating its maturity. 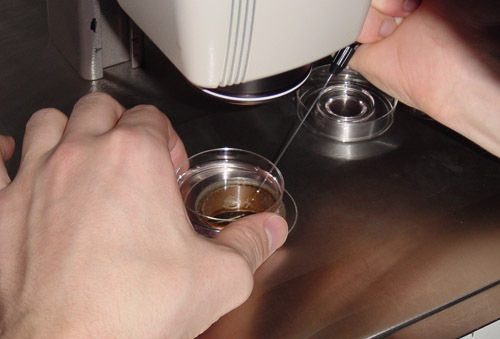 After the procedure, the oocyte will be placed into cell culture and checked on the following day for signs of fertilization. In natural fertilization sperm compete and when the first sperm enters the egg cell, the egg cell blocks the entry of any other sperm. Concern has been raised that in ICSI this sperm selection process is bypassed and the sperm is selected by the embryologist without undergoing any specific testing. Sperm present in low concentrations (oligospermia). The video shows an egg held in position with a glass holding pipette on the left. A very fine glass injection needle containing an immobilized sperm penetrates the egg from the right. 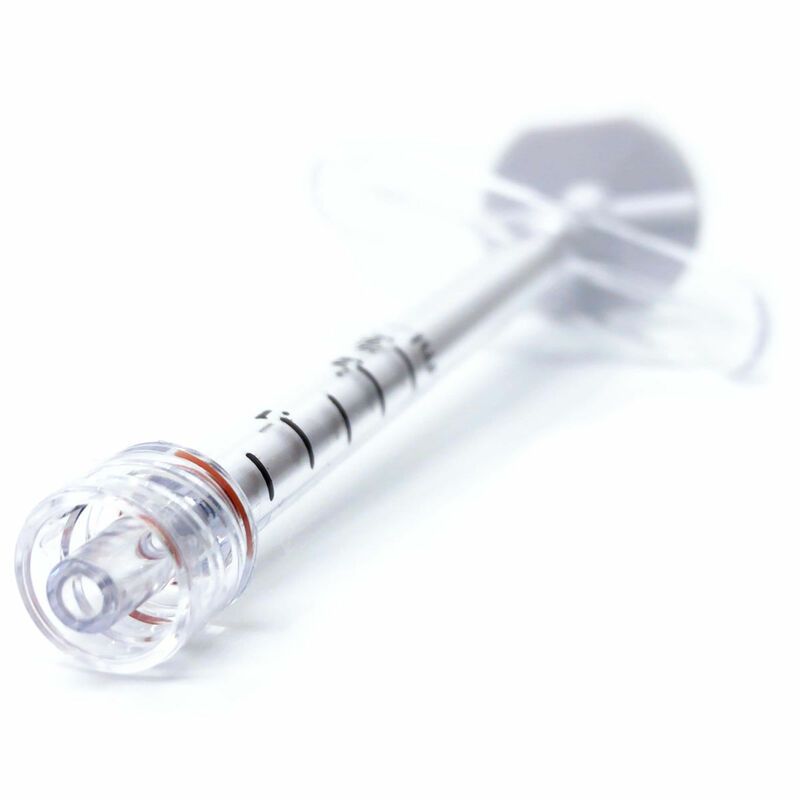 The injection needle breaks through the membrane and a small amount of cyoplasm is aspirated to confirm membrane breakage. The sperm is the inserted into the center of the egg and the needle removed. 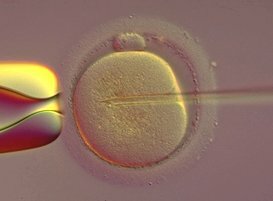 ICSI: The injection of a single sperm into an oocyte. ICSI: Image taken by Andy Glew. Essex Fertility Centre, UK. 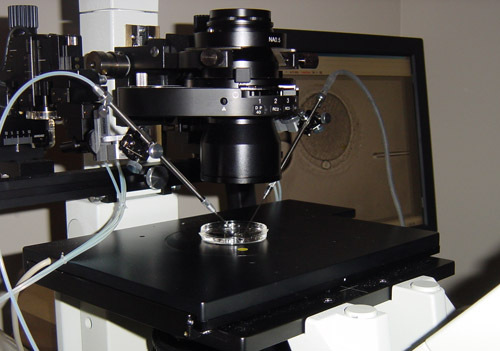 A micromanipulation setup for ICSI. Removal of cumulas cells surrounding the egg prior to ICSI.